The American League defeated the National League 8-6 in Tuesday nights All Star game in Washington DC. The Brewers had five representatives. Christian Yelich went 1 for 3 with a homerun. Jesus Aguilar and Lorenzo Cain went 0-2 and Jeremy Jeffress pitched a scoreless inning. 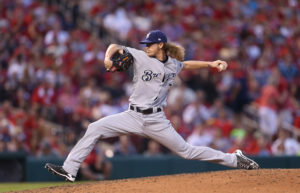 Josh Hader allowed a 3-run homerun to former Brewer Jean Segura in the eighth inning that gave the A.L. a 5-2 lead. The Brewers resume play on Friday night against the Los Angeles Dodgers at Miller Park. Milwaukee has lost six in a row and trail the Chicago Cubs in the N.L. Central by 2 1/2 games.